The Life House, Lagos in partnership with The African Film Festival, Inc (AFF) are proud to host the 2nd Lights, Camera, Africa!!! Film Festival in September 2012. Our inaugural festival in 2011 brought to Nigeria some of the most exciting and original pieces of African cinema from within the continent and the Diaspora that explored independence through an African lens. This year, Lights, Camera, Africa!!! 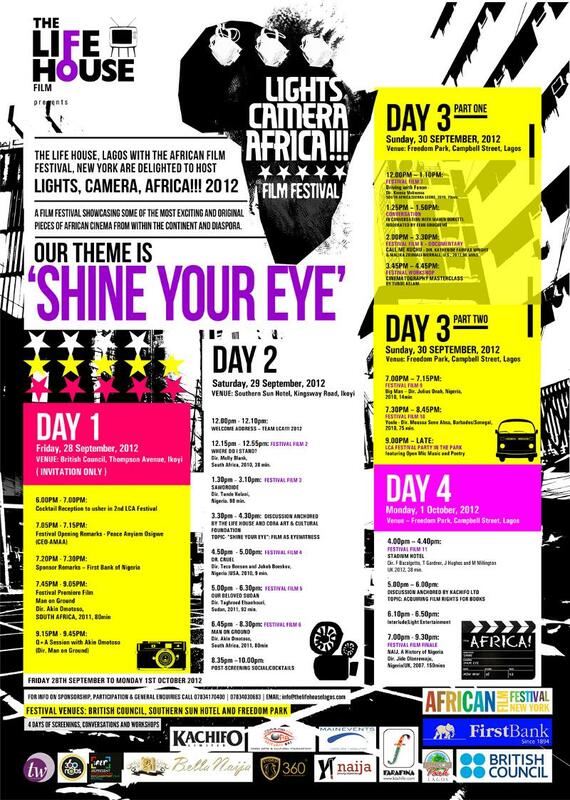 Film Festival 2012 will hold over the Independence Day holidays from Friday, 28 September to Monday, 1 October with the theme, ‘Shine your Eye’. Acclaimed short film, Big Man, by award-winning director, JULIUS ONAH, shall continue its strong run on the global film festival circuit. It shows at the Lights, Camera, AFRICA!!! 2012 Film Festival. on 30th September 2012 at 7pm. Nigeria’s foremost cinematographer, TUNDE KELANI, will teach a Cinematography Masterclass as part of LCA!!! 2012’s arts education initiative. The workshop is FREE and holds on Sunday 30th September 2012 at the British Council at 3.45pm.